Nom, Nom, Nom…my stomach was in bliss this morning! Woke up this morning, and couldn’t resist taking the time and making an effort to make some nom, nom savoury muffins. The beauty about this recipe, is that you can add other ingredients to this recipe according to whether you are vegetarian or a meat lover. I will provides some ideas below for you to experiment on! Fry the diced bacon, either in the coconut oil or let it fry with it’s own natural fat on the bacon. Fry the onion thereafter in the bacon fat (or if need more fat, use the coconut oil), until translucent & cooked. Put aside both of the above. Mix together the eggs, cream, sour cream, cheese and all the spices including salt & pepper. Add the onion & the bacon. Note, the mixture is quite runny. Spoon into pre-buttered (or non-stick sprayed) muffin tin container. Bake in a oven at 180 degree celsius for around 25-30minutes. 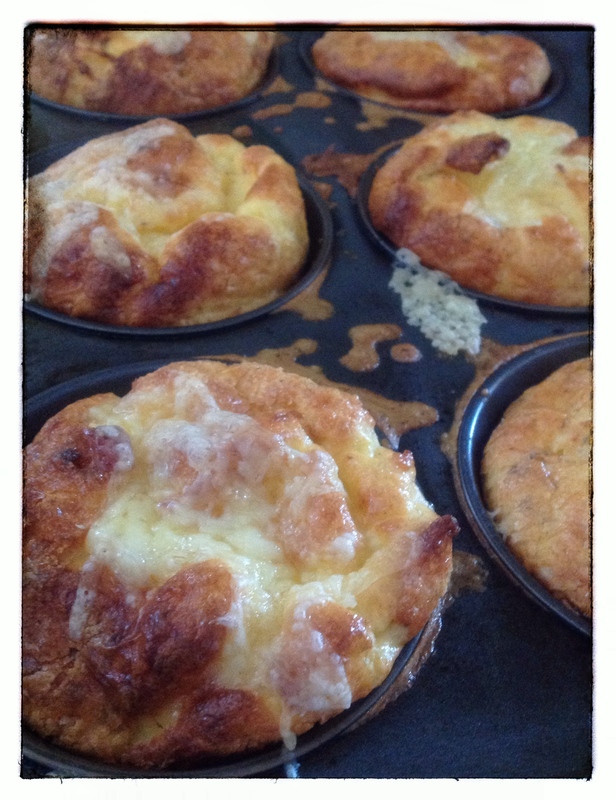 The last 5 minutes, add some cheese on top of the muffin, for a nice crisp cheesy finish! LCHF options: Instead of bacon, you can add pre-cooked thinly sliced mushrooms (125g), or finely shredded spinach (50g or more depending on how much spinach you want), or pre-cooked chopped asparagus (8 spears)…basically most pre-cooked vegetables could be added to this mixture. And if you don’t want bacon, pieces of chicken, gammon, chorizo etc can be added instead. Experiment & enjoy! This entry was posted in Baking as easy as 1..2..3, LCHF recipes and tagged bacon, cheddar, creme fraiche, LCHF, savory muffins, savoury muffins, sour cream by angelb38. Bookmark the permalink.